I suppose it wasn’t in Eichmann‘s favour that I re-watched Valkyrie just before I saw Eichmann. I would say I liked Valkyrie even better the second time. I’m sure it is a movie which aims at entertaining and plays on emotions but at least that is very well done and Tom Cruise is outstanding in this movie. I do have huge problems with the man Tom Cruise but I can’t help admiring the actor. The movie opens in North Africa in 1942. 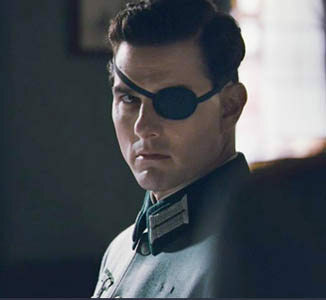 Colonel Claus von Stauffenberg (Tom Cruise) is far from content with the regime and openly utters his criticism. Before retreating with his troops he gets under attack and loses his right hand, an eye and two fingers on the left hand. Some time later, back in Berlin, after a painful recovery, he is recruited by a group of high German officers and politicians who want to overthrow the regime. They think it is of the highest importance to do something in order to let the world see that there were not only Nazis in Germany. The way to go according to these men is to assassinate Hitler. Preferably together with Himmler. After several failed attempts they recruit von Stauffenberg. He seems to be the only one to be able to come up with a plan and to see it through. Assassinating Hitler isn’t enough. At the same time the group needs to assure that the Army is on their side. The idea von Stauffeberg comes up with is ingenious and based on adapting “Operation Valkyrie” to their own needs. The amended Operation Valkyrie would enable them to seize control of Berlin after the assassination of the Führer. As this movie is based on historical facts, I don’t suppose it is a spoiler to say that they failed. The plan was cunning, the execution well done but bad luck and bad timing prevented a success. All the men participating in the coup were executed. This is one of those movies during which we hope against all hope and constantly wonder why it didn’t work. Just like Sophie Scholl, Valkyrie manages to show what courageous and unselfish people are capable of doing. The movie Eichmann illustrates very well that a fascinating topic doesn’t guarantee a good movie. Even though Valkyrie is a US-German co-production it’s pure Hollywood but it’s very well acted and gripping despite the fact that we know the outcome. The way the story is told and the cast makes this such a good movie. 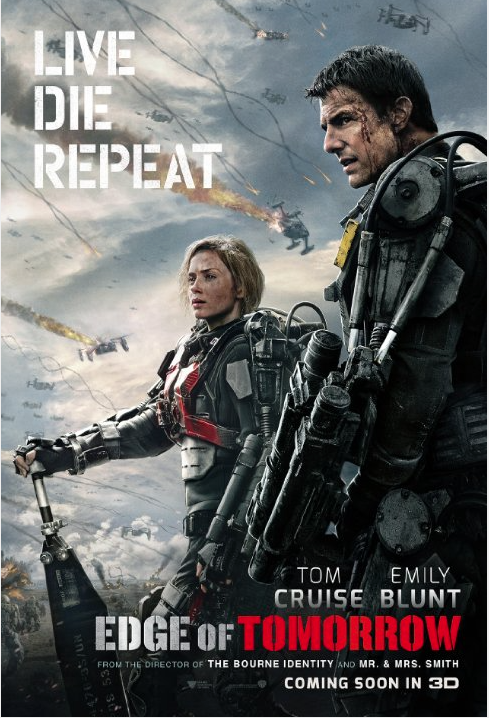 Apart from Tom Cruise, the actors worth mentioning are Kenneth Branagh as Major-General Henning von Tresckow, Bill Nighy as General Freidrich Olbricht, Thomas Kretschmann as Major Otto Ernst Remer and Carice van Houten as Nina von Stauffenberg. The only bad choice was David Bamber as Hitler. I think he’s the worst Hitler I’ve ever seen. Valkyrie is based on a great story and very well told. While it’s not flawless, it’s still a must-see. Take an American and put him into an exotic decor. Most of the time that goes very wrong. Occasionally it doesn’t and what comes out is an entertaining guilty pleasure like The Last Samurai, a movie midway between The Last of the Mohicans and Memoirs of a Geisha. Although it is not at the same level of Glory, one of my Top 10 war movies and Edward Zwick’s masterpiece, Last of the Samurai is equally beautiful. Captain Nathan Algren (Tom Cruise) is a hardened, disillusioned and alcoholic veteran of the Civil War. Touring as special attraction with some sort of circus, he has clearly seen better days. He is haunted by what he saw in the war, the killings of the Indians, the battles. While in this sorry state, he is approached by some Americans who want to hire him as military advisor for a newly established Imperial Japanese Army. If it pays good money, he would probably sell his mother, so he doesn’t hesitate long and follows the men to Japan. The army consists mainly of peasants with no experience whatsoever in warfare. Despite their not being ready, one of the emperor’s advisors wants Algren to lead them to battle against rebellious Samurai who do not want to accept the changing of the times. The moment when they are surrounded by these warriors in their incredible armour, it’s obvious they will lose the fight. In the chaos and mayhem that follows, Algren who has been severely wounded is taken prisoner by the Samurai and brought to their village high up in the mountains. The landscapes and images are extremely beautiful, the ways of the Samurai seem mysterious and we can easily understand that Algren is fascinated. The moment he arrives in the village – and not only because the woman who takes care of him is very beautiful – he tries to immerse himself in the culture and the rituals of this ancient tradition. In the months that he spends with them he learns their ways of living and fighting and becomes the friend of the their leader Katsumoto (Ken Watanabe). When the imperial army attacks, he fights with him until the last. I enjoyed the final battle and seeing the battle formations, it reminded me a bit of Waterloo. I was surprised that I liked this movie I had thought it would be tacky but it is really not bad at all. Plus I have a thing for the Samurai armour. It’s one of the most beautiful armour in history. And their weapons are also quite fascinating, they didn’t use firearms. It’s a very visual movie, with a good story. In other words, excellent entertainment. Should I Really Review Tropic Thunder? Now what? Should I review Tropic Thunder? After all there is a reputation at stake. Btw I think Tom Cruise in incredible in this. Not as good as in Magnolia but really good.